Female Writers/Male Writers - Who Do You Read? Female Writers/Male Writers – Who Do You Read? My mom’s favorite books were mysteries. From Rita Mae Brown to Iain Pears to Alexander McCall Smith. She loved them all. My dad loves westerns – Zane Gray, Louis L’Amour, Ivan Doig. He’s a man who appreciates a good gunfight and a happy ending. But this is not ALL my parents read. Mom also read Anne Lamott and books about how the Irish saved civilization. She read Stephen Jay Gould’s books on science and evolution, and every once in a while, she slipped in a literary novel by Oscar Hijuelos. Dad recently finished Hot Flat and Crowded by Thomas Friedman, and he loves the work of Luis Urrea. He’s not narrow in his reading choices. But one thing I do know about my parents’ reading habits – my mother chose books by both men and women. My father read – almost exclusively – books by men. I know this is not a conscious choice on my dad’s part. He doesn’t despise women or women’s writings. But he has been socialized to think that books by women are FOR women. Many men have. Quietly, our culture has taught men that women don’t have much of worth to say to them, even when they write about topics that are universal and not just the stereotypical “women’s topics” like romance (as if men are never part of that experience) or parenting (again, sometimes guys have a role to play there, too.) It seems we have decided as a culture that men can speak with authority to all people, but women can only speak to women. This breaks my heart. As a woman. As a writer. But more as a person. I’m sad to be a part of a culture that says women’s voices are not as valuable. And whether we like it or not, this is what our culture says. VIDA, an organization that supports women in the literary arts, does an annual count of the number of women who are published in major magazines around the United States. 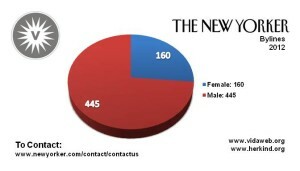 Overwhelmingly, the number of men who are published outpaces women. For example, in 2012 The Nation gave bylines to 393 men and only 192 women, and The New Yorker was even more inequitable with 445 bylines going to men and just 160 going to women. Every time I look at this count, I am left dumb-founded. How is it that in the 21st century we still have these vast disparities between the voices we give public access and those we don’t? It seems impossible, but I know it’s the truth. I’ve lived it. I live it now. I don’t know what the answer is to this problem. I know I intentionally read broadly – men and women writers; white, black, asian, native american, hispanic writers; contemporary writers and traditional writers – but I know I could do better. I read a disproportionate number of women writers, without a doubt. Maybe the key is simply to be aware, to make a conscious choice to see our own reading behaviors and try to make them more diverse and equitable. Maybe the key is to just see. So who do you read? More men? More women? Why do you choose those writers over others? Lisa Colon Delay and Jennifer Luitweiler are addressing this idea of “Who Do You Read?” over on their blogs in the coming days, and I think I’ll be writing about this gender gap in writing for a few more days here. I hope you’ll check out their work and join in this conversation – it’s an important one.